Home Lifestyle Home Garden & Tools Smart Care of Your Carpet. The moment to clean your carpets has always been dreaded by house owners, as the only option generally available was to send it to a dedicated carpet cleaner company. Carpets are either heavy, delicate or both, take forever to air-dry — that is, if you even have the space to put them to air-dry in the first place — and tend to accumulate a lot of dirt, dust and other debris. Of course, now that smart technology is becoming stable in cleaning, it should obviously make taking care of your carpet easier. ● Smart Carpets: prevent your carpet from getting dirty in the first place! ● Smart Washing Machines: modern, smart washing machines can wash rugs and carpets just fine, being controllable even if you’re not at home. ● Vacuum Cleaner Robots: automated, regular vacuuming makes taking care of your carpet much easier, keeping them clean. ● Automatic Carpet Cleaners: for deeper cleanings, you now have portable, automated options to keep your carpet clean, right where it is. As you would expect, the first application of smart technologies that is important to us is in the carpet themselves. As this article from Fibre2Fashion explains, we now have carpets made with smart, synthetic fabric, capable of reducing stains while also acting as an antimicrobial agent in your house. This not only helps to improve the quality of the air indoors, it also helps to keep the carpet itself cleaner, working by itself against the proliferation of bacteria and mold. These types of carpets are also capable of trapping dust particles within its fiber structure while also easily releasing these particles if they’re vacuumed. One example of such carpet technology is SmartStrand, employed by Mohawk Flooring. It makes carpets virtually immune to flattening and stains, eliminating the worry that children or pets might cause any permanent, far-reaching damage to your carpet. The first important step to help cleaning your carpet is to make it immune to most hazards, and new technologies are capable of doing just that, drastically decreasing your need for cumbersome cleaning routines that last for an entire day, which happen because of one little disaster that lasts seconds. The truth about washing machines is that you can, in fact, use them to wash rugs and carpets, depending on the rug’s weight and size. It doesn’t mean you should, especially when we’re talking about woven or small braided carpets with a rubber backing. But as Apartment Therapy clarifies, cotton or synthetic fiber can go in the washing machine just fine as long as you use cold water and a gentle cycle. So a smart carpet like the ones mentioned above would come in handy here too since they are synthetic. However and in any case, it’s easier to take care of your carpet with a smart washing machine. This new generation of washing machines’ greatest advantage is that you can control them remotely, even outside your own house. You can set, program and pause washing cycles and, most importantly, monitor the general condition of your clothes and the washing machine itself through the dedicated app. ● The Samsung WW10H9600EW Smart Machine features a much steeper price tag, but is way quieter and has a better performance overall. It can also be more easily integrated within the context of a smart home in a Samsung ecosystem if you own a Samsung smartphone or hub, for example. ● The Hoover DWTL49AIW3 Smart Washing Machine is way cheaper, has a better guarantee length and has impressive features, but has a somewhat weaker performance and less capacity when compared to the Samsung competitor. 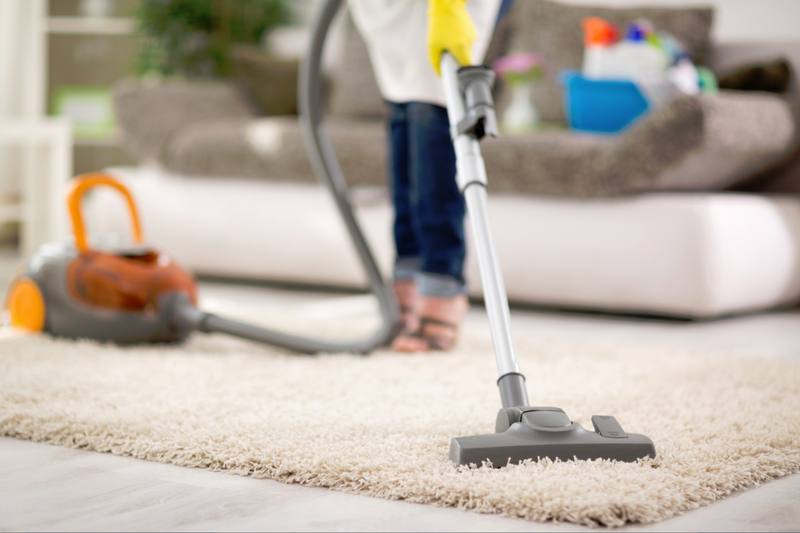 Regular vacuuming is the key to keep your carpets in top condition. You would normally not vacuum every carpet in your house, every single day. That would be an insane amount of effort and time spent. However, smart technologies also help in this aspect: nowadays, we have robots that can do that for us every day, freeing us from worrying about the cleanliness of our carpets. Most models and brands will offer a great, comprehensive cleaning routine, including almost any type of floor in it. However, you should pay attention to the specs of any model you may want to buy and see if it suits your house and needs. Two of the most successful models are the eufy RoboVac 11 Plus and the ECOVACS DEEBOT N79S. In this comparison, we’ll review both models to help you understand their differences: ● ECOVACS DEEBOT N79S: Designed for hard floors and thin carpets, the DEEBOT N79S can be easily integrated with a smart home environment: it has Alexa connectivity and can be controlled remotely. It also has an anti-collision and anti-drop sensor system, enabling smart motion around your house for up to two hours before driving itself to charge. Its list price is, however, a little bit higher. ● eufy RoboVac 11: Made for hard floors and thin-to-medium carpets, this model has an autonomy of one hour and a half before it returns to the charging base. It has a tempered glass cover that makes it very durable and automatically detects when it needs to use more suction power. The lack of smart device integration makes it cheaper, but also harder to be controlled from outside your house, for example. Lastly, if you need a smart solution for deep cleaning, you can try an automatic carpet cleaner. These can do everything an industrial washing machine would —spraying, brushing and sucking to remove stains and otherwise difficult to remove messes. However, you don’t have to leave your house to do it. The BISSELL SpotBot Pet Handsfree Spot and Stain Portable Carpet and Upholstery Cleaner is a reliable option for those who need a more thorough cleaning in their carpets, in case all the last options are unavailable to you. Thus, we have completed the list of smart technologies that can ease and improve your carpet care. It’s important to remember smart devices can improve all aspects of our lives and cleaning is certainly one of them!